Hallowe’en is a time for ghostly tales and spooky stories, macabre scenes and haunting vignettes. So as an October 31 treat, let us explore one of those from the high seas, that of the Flying Dutchman . . . and of course, provide rules for its inclusion in the Great War at Sea and Second World War at Sea series! Few have not heard the various tellings of the Flying Dutchman tale, that of a ghostly ship condemned to sail the seas until Judgment Day for reasons ranging from the hubris of her captain to dastardly acts committed by her crew. The phantom is usually described as a large 17th century sailing vessel, perhaps an Indies merchant or Dutch man of war. Some versions have her shrouded in fog, glowing mists, or obscured by a localized patch of rain and storm clouds. Sighting her is considered a bad omen by sailors, with disaster sometimes striking the luckless ship or hapless lookouts soon after a glimpse of the specter is caught. And woe to those mariners who have the misfortune of directly interacting with her crew, for they may find themselves becoming unwilling passengers on the eternal voyage, or struck down for accepting mail from the phantom. The precise origin of the legend is lost in time; while printed accounts describing the tale began to appear in the late 1700’s (apparently based on sailors’ legends from the previous century), it is quite possible the story is based on folklore retelling of tales like that of Odysseus, cursed by Zeus never to be able to return home and forced to wander the Mediterranean for years, or perhaps instead a nautical version of the Wandering Jew. As the legend evolved through the 1800’s, it moved from that of a phantom spawned by misfortune, to one of a damned ship and crew cursed to sail forever as punishment for various transgressions against Higher Powers. The account continues with Barrington later shaken awake by a panicked boatswain, who claims to have just seen the Dutchman of legend while on deck (and requires calming liquor). However after some investigation, the exile speculates the sighting probably had more to do with the boatswain’s copious consumption of alcohol (“a good pull or two at the Hollands” followed later by “another swig at the Geneva”) combined with a shrouded view of bioluminescence and reflections from ships’ lanterns off the mist, as opposed to phantom vessels from the past. 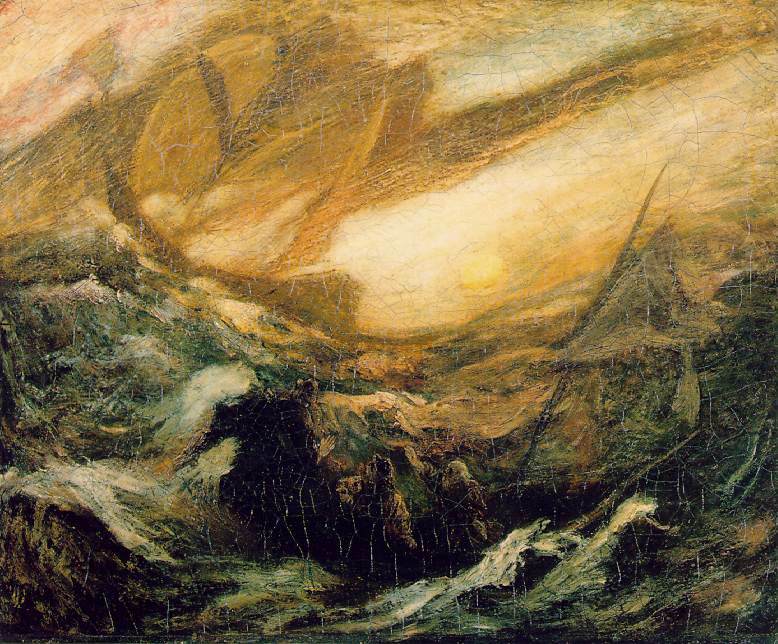 This story also adds the aspect of the doomed captain attempting to get vessels he encounters to carry letters back home to friends and family long passed, however acceptance of the letters is perilous for the carrier, “for as they say, there is sometimes a sinking weight” in the Dutchman’s paper. The tale of Vanderdecken is further recounted and expanded in the theatrical The Flying Dutchman (1826) by playwright Edward Fitzball, and the novel The Phantom Ship (1839) by Royal Navy officer and writer Frederick Marryat. Mighty Richard Wagner spread the varied legend further with his well-known opera “Der fliegende Holländer” (1843). Based on a story by poet Heinrich Heine, the crew are doomed to sail the ocean (in this case, the North Sea) as a consequence of the captain’s arrogance, until the proud captain (the Dutchman, otherwise referred to as “The Stranger”) can find redemption through the love of a woman. Allowed ashore, the Dutchman catches the eye of a young lady, Senta, who at the end sacrifices herself to free the captain from his curse. The ghost ship vanishes, and the two lovers ascend to Heaven (thus concluding the legend?). “July 11th.—At 4 A.M. the Flying Dutchman crossed our bows. A strange red light as of a phantom ship all aglow, in the midst of which light the masts, spars, and sails of a brig 200 yards distant stood out in strong relief as she came up on the port bow. The look-out man on the forecastle reported her as close on the port bow, where also the officer of the watch from the bridge clearly saw her, as did also the quarterdeck midshipman, who was sent forward at once to the forecastle; but on arriving there no vestige nor any sign whatever of any material ship was to be seen either near or right away to the horizon, the night being clear and the sea calm. Thirteen persons altogether saw her, but whether it was Van Diemen or the Flying Dutchman or who else must remain unknown. Blutroth die Segel, schwarz der Mast? Hui!—Wie Sauft der Wind !—Johohe! Hui!—Wie pfeift's im Tau !—Johohe! Fortunately an ill fate did not befall the Princes (at least immediately?). And the quotation of lines from Wagner’s opera, popular in London still, give some strength to the idea that more than a little imagination and/or embellishment may have been involved in the printed version of the tale, perhaps on the part of John Dalton, their chaperone on the voyage who assembled the record from the Princes’ notes. And as an aside, it is unclear if the mention of “Van Diemen” refers to another yet another spectral vessel haunting these waters, or the island of Tasmania, once referred to as Van Diemen’s Land and close to the course of the cadet voyage. Several authors of folklore studies describe an World War II encounter between the Flying Dutchman and Nicholas Monsarrat (author of such tales as The Cruel Sea and Three Corvettes), however the basis for this story appears quite thin, and the author himself makes no mention of the encounter in his autobiography. However there is no small similarity between the protagonist of Monsarrat’s Master Mariner and the captain of the Flying Dutchman, so perhaps some contact, literary or otherwise, did occur. Stories of sightings of the Dutchman by Dönitz’s U-boats are similarly with vague basis, as cloudy as the mists purportedly surrounding the phantom vessel, and may well be legends in their own right. The GrossAdmiral makes no mention of these encounters in his memoirs. Traffic near the most common haunt of the Flying Dutchman, the Cape of Good Hope, declined significantly after the opening of the Suez Canal, and along with it, tales of the Dutchman. Sporadic sightings were reported up until the 1950’s, and the odd tale still continues to surface in the dens haunted by sailors (particularly those of supertankers, unable to transit the Suez). But in this day of radar, infrared cameras, satellite imagery and scientific method, the ghostly vessel may well have finally made her long-sought destination and finally achieved redemption and eternal rest for her crew. A good ghost story deserves good opportunities for players to tell their own versions over the game table, preferably late at night, by guttering candles, and a bottle of gin or rum handy (beer probably works too), the strains of “Der fliegende Holländer” audible in the background along with the moaning of the wind. As such, we’ve presented the following options for those who wish to include the phantom Dutchman in their cardboard endeavors. While many legends and sightings of the Flying Dutchman occur near the Cape of Good Hope (no series map yet) or near the Dutch East Indies (Java and Malaya maps from SWWAS Strike South and Leyte Gulf), the Dutchman may make an appearance in any game from either series. Recall Wagner’s version takes place in the North Sea! On every night turn, roll 2D6. Add one to the result if playing on the Strike South maps. On a result of 12, the Flying Dutchman makes an appearance near one of the fleets or groups of ships on the map, and remains on the map until either a contact situation is resolved or until the next daylight turn. Players should decide in advance whether to treat the Dutchman as a specter feared by all, or a ghost somewhat sympathetic to the seafaring Dutch. Per the ghostly tales, the sight of the Flying Dutchman is one to be feared by all. If the Dutchman appears, roll 1D6: on a 1-3, the Dutchman will appear near a Central Powers/Axis fleet (or ships in port, if no fleets active), otherwise an Allied fleet (or ships in port). If the specified player has no ships, the encounter is skipped. Once the side is determined, randomly determine which fleet (or port with ships, if no fleets), the Dutchman has manifested near. Finally roll 1D6 to determine the distance in sea zones the Dutchman sets up from the target fleet, and one last 1D6 to determine the orientation (NE, E, SE, SW, W or NW as appropriate). If the result is a land hex, place the Dutchman towards the target fleet in the closest coastal hex to the target. Use a Dutch ship from Soldier Kings to denote the Dutchman, or a similar marker. The Flying Dutchman is sometimes surrounded by foul weather. After the ship is placed, roll 1D3 and add it to the current weather level (to a maximum of 6); this is the weather level affecting the hex containing the Dutchman plus all immediately adjacent hexes. Once placed, each turn the Dutchman automatically moves towards the closest fleet or fleets on the board (operational speed is 3), after both players have made their moves but before any contract rolls have been made. Resolve any ambiguity (for example, more than one fleet at the same distance) with a die roll. The Dutchman will attempt to move into the same hex as the closest fleet, at which point contact is automatic. If more than one fleet is in the hex, randomly determine the one contacted. Contact with the Dutchman is resolved before any contact between players’ fleets is checked. If submarines capable of night contact are in play, if after the Dutchman has moved, no fleet has been contacted, both players roll for submarine contact with the Dutchman. No additional modifiers are applied to the contact rolls. While there are no indications in the Flying Dutchman tales of the ghost ship showing any loyalty or bias towards vessels encountered on the high seas, as a variant, assume the Dutchman is sympathetic to the side which has Dutch units or use of (unoccupied) Dutch ports. In this case, the Dutchman will appear next to one of the opponent’s fleets or groups of ships (determine which one randomly as above). The Dutchman never attempts to contact fleets, ships or submarines of the player having Dutch units or ports; and the weather affects of the Dutchman are ignored by that player as well. All other rules for the “Cursed Dutchman” apply. 2 or 12, Letters from the Damned. A ship in the contacted group has been foolish enough to accept a party from the ghost ship aboard, which leaves letters to family and friends long dead to be delivered. When the ghost ship vanishes, the ship accepting the letters vanishes as well, trying in vain to deliver the letters to the past. Randomly remove one ship from the group, or the contacting submarine (no VP awarded to the opposing player). 3 or 11, Herald of Storms. The weather effects of the Dutchman remain with the contacted group for the next six turns, affecting the sea zone it is in plus those adjacent. Units of the opposing player are unaffected by this localized weather (even when making contact attempts against the affected player’s units). If the contact was made by a submarine, the submarine or flotilla sea zone is the center of affected weather. 4 or 10, Collision! Attempting to avoid a collision with the approaching phantom, two of the ships in the contacted fleet or group collide. Randomly draw two ships, and resolve damage per GWAS ramming rules as described in U.S. Navy Plan Scarlet (randomly determine which one initiates the collision). If contact is by a submarine in a flotilla with more than one sub, remove one submarine from the flotilla. If contact is by a single ship or submarine, the contacting unit may not move or make contact attempts until the next daylight turn. 5 or 9, Superstition over Valor. Overcome with superstition, the contacted fleet must abort to the nearest port. If a submarine, remove from play. 6-8, Did You See That? Ships in the fleet share news of their encounter, much to the annoyance of the Admiralty. The player owning the fleet must announce the composition of the contacted fleet: number of capital and light ships, number of transports, presence of carriers. If a submarine, announce its presence (or the location of the flotilla it is part of, and how many submarines are in the flotilla). 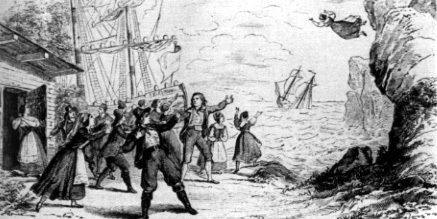 After resolving contact, the Flying Dutchman is removed from the map. Resume checking for the re-appearance of the Flying Dutchman on each night turn.